As efforts to fundamentally overcome the management challenges your company have, we provide a full-scale deployment of supporting solutions centering on M&A to drastically improve the corporate value. We expect that these management reform solutions which are extremely effective for strengthening and expanding the management foundation and prompt improvement of business competitiveness will contribute profoundly to advancement of the corporate value in your company. 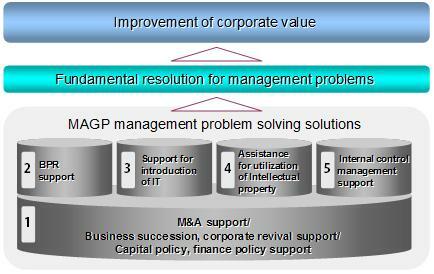 M&A Global Partners (MAGP) is the best advisor to support improvement of your company’s corporate value. We assist the management reform centering on M&A as a solution to fundamentally solve the management problems of your company. - Years and plenty of experience in planning and implementation of corporate reorganization/revival, business succession, capital policy, etc. - Supported by experts who have high expertise in finance, law, intellectual property, IT and management strategy. - Corporate analysis and value evaluation from multiple viewpoints such as finance, business process, business infrastructure, etc. - Assistance for intellectual property stock taking and strategic leverage of intellectual property through finding licensees and etc. MAGP provide you with management problem solving resolutions which will greatly contribute to expansion of management foundation and enhancement of business competitiveness in your company. Let us introduce our efforts to accomplish not temporary measures but fundamental resolutions for management challenges your company has. MAGP provide you with professional one-stop services in conjunction with experts such as law firms, accounting firms, etc. ©2008- M&A Global Partners Co., Ltd. All rights reserved.